YANGON -- Campaigners are calling for Myanmar to review the convictions of 20 Muslims jailed on terrorism charges after the Southeast Asian country repealed an authoritarian law under which they were convicted. 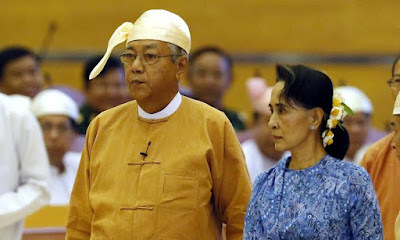 President Htin Kyaw had signed off on a bill abolishing the notorious Emergency Provisions Act of 1950, which was frequently used by previous military governments to quash dissent, his office said in a statement on Tuesday. But the repeal is not retroactive, and the convictions of 20 Myanmar Muslims serving lengthy prison terms under the law were not being reviewed, ruling party and government spokesmen have told Reuters, despite activists' concerns about the judicial process. "It is incumbent upon the government to review cases that involve defendants who possibly were wrongly convicted under this law," said Matthew Smith, founder of campaign group Fortify Rights. "To not do so raises some serious questions about the government's commitment to ensuring the prisons are free from political prisoners." Aung San Suu Kyi, the democracy hero and Nobel laureate who assumed power in April after winning elections last year, has been criticized for not speaking up for Myanmar's Muslim minority. Communal violence in the western Rakhine State displaced about 125,000, most from the Rohingya Muslim group. Riots have broken out elsewhere in the Buddhist-majority country, while anti-Muslim hate speech has proliferated online. Lawyers and family members told Reuters the 20, most hailing from central Myanmar, were traveling to a wedding in the eastern Shan State in August 2014 when they were detained by military intelligence officials, accused of plotting terrorist atrocities and charged under the 1950 law. In January 2015, 19 men and women were sentenced to 14 years in prison each and a boy, who was 15 when he was arrested, got seven years, said lawyer Khin Moe Moe. "Usually we're not able to defend people in cases involving Military Security Affairs. They have a policy to never lose," she said, referring to the military intelligence agency. Several appeals had been rejected, Khin Moe Moe said. “The president agreed this law led to mistreatment of the people, and many still suffer in prisons throughout the country, so they should have an amnesty," she said. One of the 20, Bo Bo Aung, had hoped for release when the new government took power, but that hope had faded, his wife, Khin Moe Aye, told Reuters. “It's two years wasted in prison," she said. "My family and others are suffering because these people were jailed without justice by the previous government." Lieutenant Colonel Myat Min Soe, a military intelligence official involved in the investigation, said that while no weapons had been discovered, the suspects had all confessed under interrogation to contacting unidentified militants. "They tried to link with a terrorist organization from a foreign country. They planned to attack busy markets and crowded areas," he said. According to Fortify Rights, which has reviewed more than 300 pages of court documents, a name card for a rebel army commander and an audio file of a speech with alleged Islamist militant content, retrieved from a computer, were the only evidence presented to court. “It’s as if the court was fulfilling a mission to prosecute Muslims regardless of the evidence against them and regardless of rule of law," Smith said. A spokesman for Suu Kyi's ruling party, Win Htein, and Zaw Htay, spokesman for the president's office, both said the case was an issue for the judiciary. "If they don't agree they can appeal the decision to the next higher level of the courts,” Zaw Htay said.